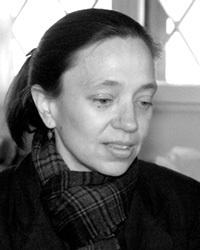 Eléna Rivera is the author of Mistakes, Accidents, and a Want of Liberty (Barque Press, 2006), Suggestions at Every Turn (Seeing Eye Books, 2005), Unknowne Land (Kelsey St. Press, 2000), and a pamphlet entitled Disturbances in the Ocean of Air (Phylum Press, 2006). Recent work appears in Five Fingers Review, The Poker, www.tarpaulinsky.com and the Poetry Salzburg Review. Beard of Bees Press is also pleased to offer an audio version of In Respect of Distance (mp3, 12MB), read by the author.